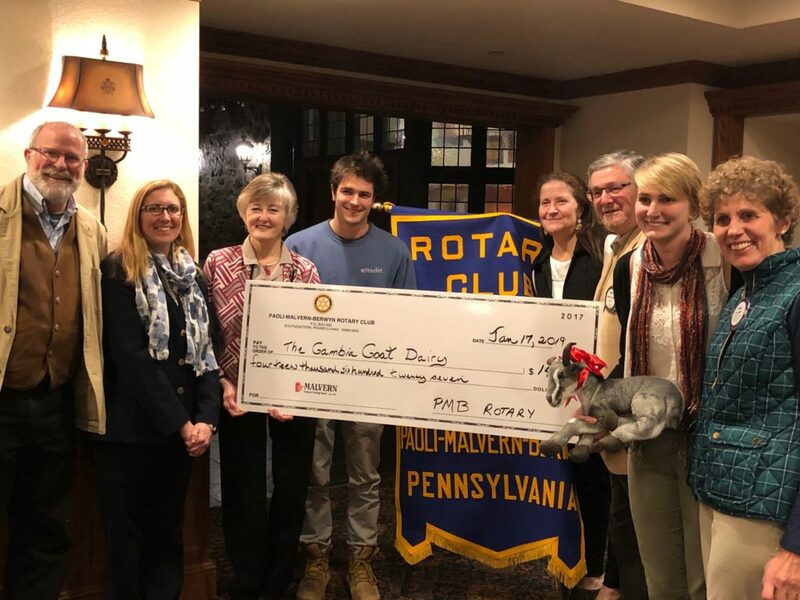 During our January 17th Meeting, PMB Rotary presented a check for $14627.00 to Dr Brianna Parsons and Dr Corey Spies for the Gambia Goat Dairy Project. The check was for a Rotary District 7450 Grant. Several clubs as well as private donations funded the project. Pictured are Dr Carla Chieffo (PMB Rotary Club), Bonnie Korengel (Longwood Rotary Club), May Lou Stockton (Upper Main Line Rotary Club) and Mike Alofsin (Gundaker). 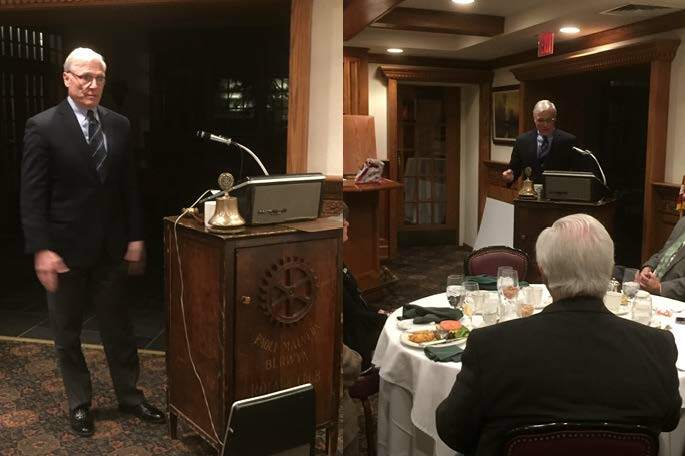 Dawn DeFuria, past District Governor was instrumental in getting District funding for this grant and Les Rosenwinkel (Chestnut Hill Rotary Club) were unable to attend. Dr David Galligan and Margaret Leardi of University of Pennsylvania School of Veterinary Medicine also attended. Presentation of the check. From L-to-R are Dr David Galligan Professor of Animal Health Economics University of Pennsylvania School of Veterinary Medicine (UPSVM) and advisor to the project; Margaret Leardi, Director of Development at UPSVM New Bolton Center; Bonnie Korengel, Longwood Rotary Club; Corey Spies 4th year veterinary student Intern working in Gambia; May Lou Stockton, Upper Main Line Rotary Club; Mike Alofsin, PMB Rotary Club and Gundaker representative; Brianna Parsons, also a veterinary student Intern for this project and Carla Chieffo, President PMB Rotary and leading champion and coordinator of Rotarian funding for this project. Absent are Dawn DeFuria, who as past District Governor was instrumental in securing District funding and a representative from the Chestnut Hill Club. For the January 10 Meeting, Chief Andrea Testa gave a presentation on the Paoli Fire Company. The Paoli Fire Company (PFC) has been a part of the community since 1909. Chief Andrea Testa has been the Chief for the past 3 years. Firefighter Bob Robie and Fire Company President John Beatty joined Chief Testa in bringing us up to date about the fire company. The PFC serves the areas of western Tredryffin, Easttown, Willistown and parts of East Whiteland townships. Besides fire fighting and emergency rescue services, PFC also provides fire prevention and safety education, CPR and AED training and car seat installations. They are also involved with community events like junior firefighter programs (ages 14-18), open houses, Santa visits and parades. The Paoli Fire Company is a volunteer fire company with 35 volunteers. These volunteers are firefighters, emergency medical technicians and fire police. However, because the need is greater than the volunteers can handle, there are an additional 4 full-time and 9 part-time paid firefighters/EMTs to supplement t the staff, especially during weekday work hours. The volunteers are required to successfully complete the same training regimen that the paid firefighters/EMTs complete. Municipal funding provides about 35% of the budget while ambulance funding provides about 33%. The rest comes from fundraising and grants. However, only 30% of residents and businesses donate. As a member of the T-E Fire Companies Funding Coalition, the PFC is working with the townships to find a sustainable funding solution. The PFC runs 2 fundraisers a years – an evergreen wreath sale in November/December and Easter Lily sale in March/April. PMB Rotarians very much appreciated the presentation and are exploring opportunities for future support and collaboration with the PFC.